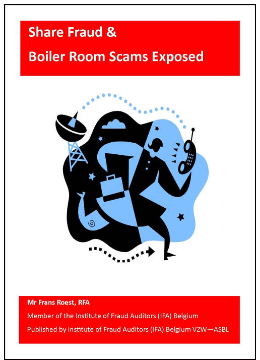 Boiler Room Fraud Exposed – This book exposes share fraud & boiler room scams. Written by dutch fraud fighter Frans Roest. A successful boiler room fraud can create more than 1,000 victims along with damages exceeding 30 million Euros. Prevention of boiler room fraud is difficult because of its social engineering aspects. The current system of warnings is clearly not effective and the temptations, in combination with the persuasive power of boiler room salesmen, is strong. This book may be able to help. The author, Frans Roest, has been studying and analyzing boiler room fraud for many years. He describes the structure and the modus operandi of international boiler rooms and identifies red flags that warn us for this evil. Although this is not his first book on the topic, it is his first in English. Because of his thorough understanding of the subject, he can address it in a structured and balanced manner. He describes the way in which sophisticated criminal organizations operate by plainly talking about sales persons, websites, phone calls, envelopes, etc. He does so effectively and without jargon, as the man in the street must be warned in a simple-to-understand manner. This book may encourage monetary authorities and associated administrations to further improve the effectiveness of their warnings about boiler rooms. Future published cautions may not only disclose the identity of the company operating without license, but also its risk profile. Investors will be alerted when this profile ‘corresponds to their boiler room’.